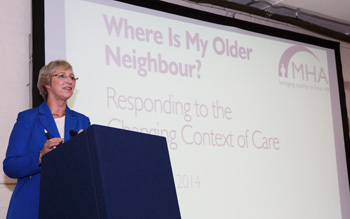 The Archdeacon of Croydon and the heads of Care England and Age UK London addressed hundreds of people at a London conference on churches and older people last week. The Ven Christopher Skilton joined Prof Martin Green of Care England and Samantha Mauger of Age UK London at Where is My Older Neighbour?, held by MHA, Psalm and London Churches Social Action. Songs of Praise presenter and MHA Patron Pam Rhodes (right) also addressed the gathering. Delivering a keynote speech, the Archdeacon noted how all humanity is made in the image of God, and drew a distinction between everlasting life, which he said related to a length of time, and eternal life, which was related to quality. Rev Dr Keith Albans, Director of Chaplaincy and Spirituality at MHA, highlighted the importance of recognising the individuality of each older person. Prof Green told the gathering that a “paradigm shift” was needed in attitudes towards older people and to recognise that they have “tremendous amount of things to contribute”, pointing out that they have already made financial contributions to the healthcare service. There was also a panel discussion with Prof Green, Ms Mauger, Annmarie Anang of London Citizens and Jill Sandham, Interim National Safeguarding Adviser for the Church of England. Participants then took part in a number of workshops covering topics such as creating dementia friendly churches and safeguarding measures for vulnerable older people.